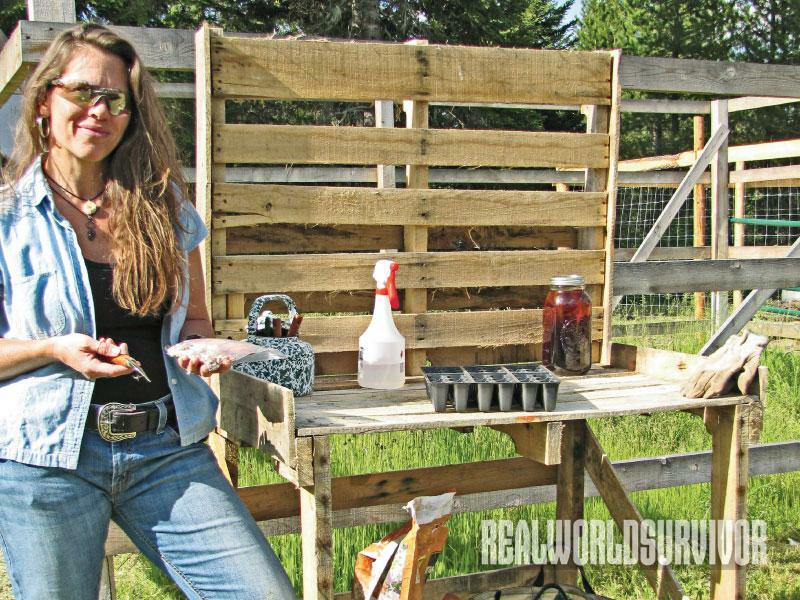 Recycle pallets into an outdoor table that’s ideal for seeding, transplanting or cooking with a solar oven. The diagonal cross supports in place. They give the table stability and strength. Last summer, we were finally able to focus on our garden and greenhouse. 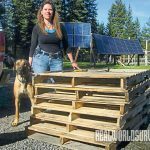 I wanted to build a potting table that could double as my solar kitchen so I could cook while working in my garden and greenhouse. 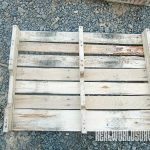 We had many pallets lying around and I decided they would be ideal for this project. 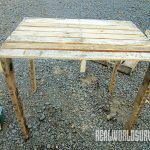 I wanted a table that would be the perfect height, allowing me to work without having to bend over, and provide a place for my All American Sun Oven that was high enough to keep wild animals and our dogs away from the food. And I needed to be able to insert and remove dishes easily from the Sun Oven. I was going for convenience, not fancy. 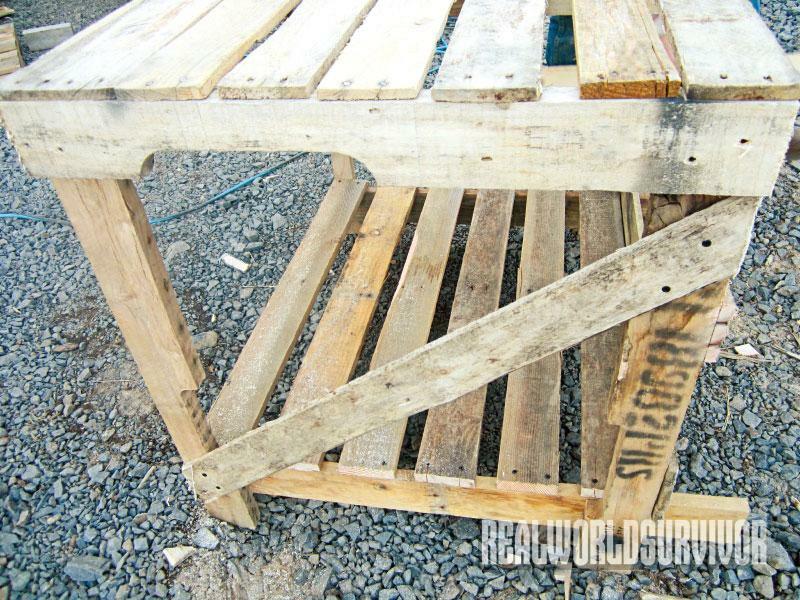 Pallets are made of varying woods such as pine and oak. I was in luck to have several oak ones available since oak is a hardwood and holds up better than pine, a softwood. 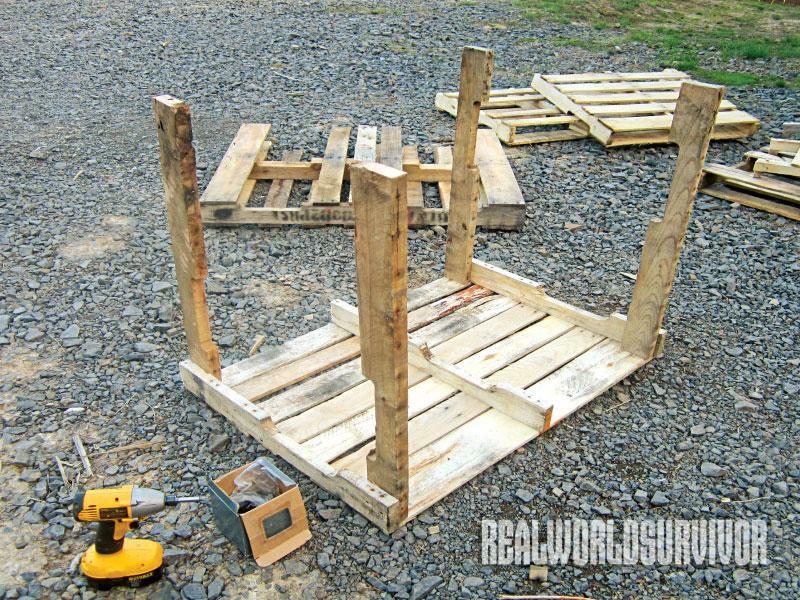 Because pallets often come in varying sizes, I have not given the instructions using exact dimensions. 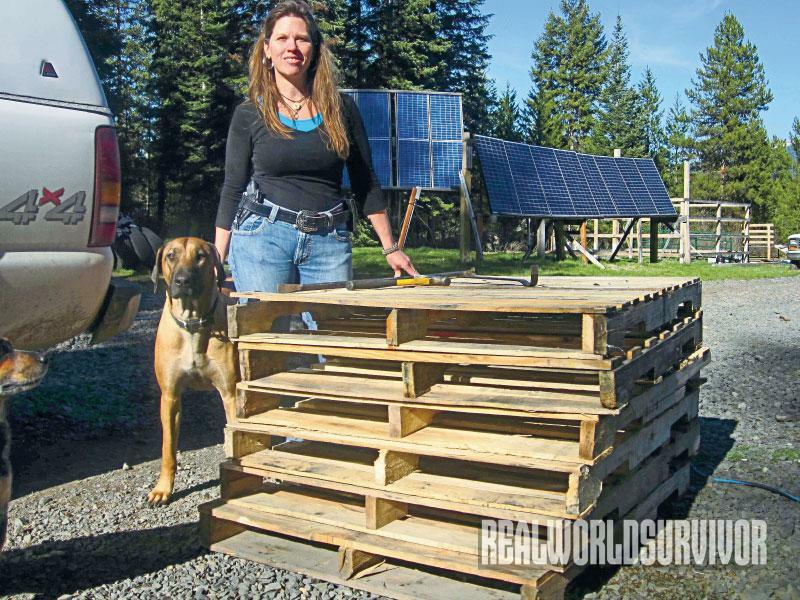 You can work with what you have and build the table. 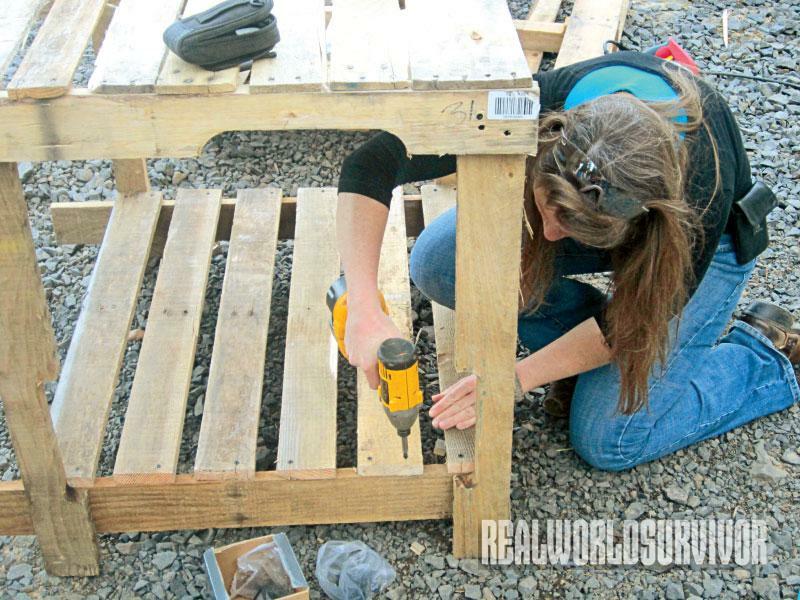 I had two pallets that were in really good shape so we used them for the tabletop and the shelf below. To prepare for the tabletop, I removed the bottom boards from the first one. 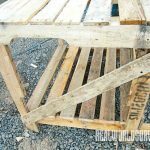 I removed the top boards from the second pallet that was in good shape to use for the shelf, and took the third pallet completely apart to utilize some of the outer boards for supports and the inner boards for the legs. 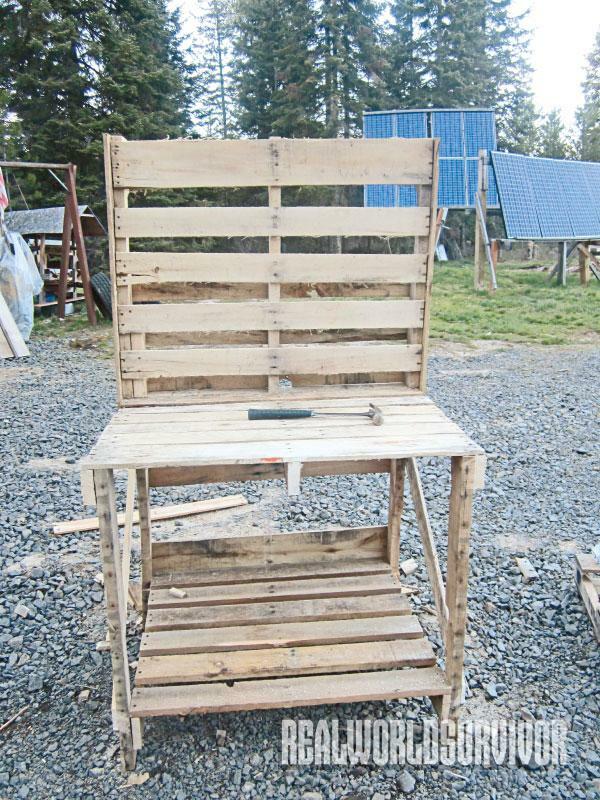 Depending on your height, if you are taller than 5′ 7″, you may need to use something other than pallet boards for the legs. For me, they are an ideal height. 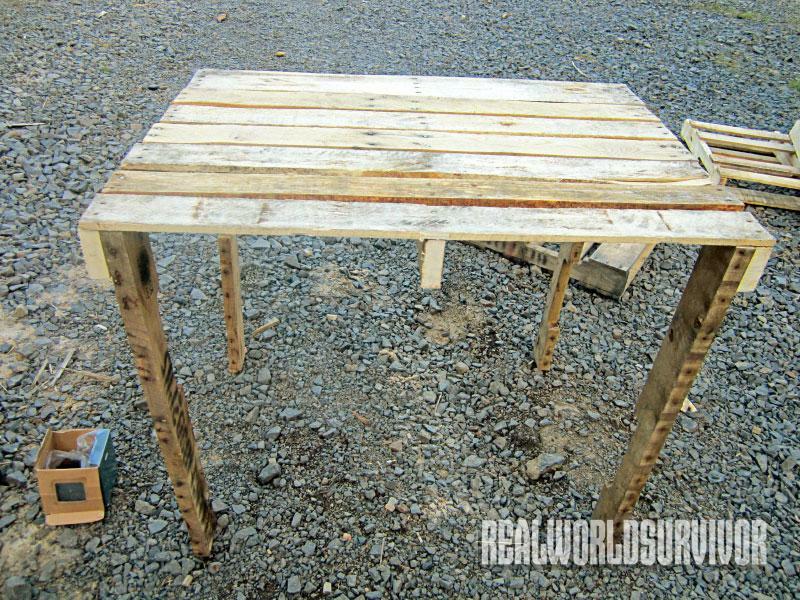 The next step was to attach the legs to the bottom of the table. 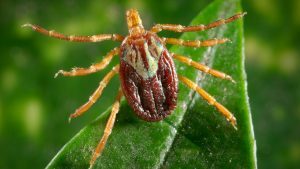 Double-check that all the legs are the exact same length. 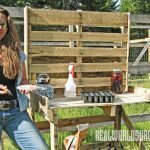 If they are off a little, use a reciprocating or circular saw to trim them. I use a square and pencil to make cut marks on the wood. You can then screw on the legs. Coated 1 1/2-inch deck screws work best. 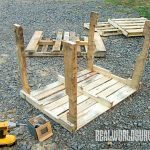 Now flip the table over and add the bottom shelf, which will get your table squared up and ready for additional supports. 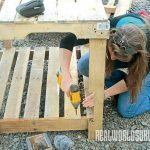 Take a full-sized board that you removed from the top or bottom of the pallet and place one squared end on the left front leg and decide how high you want the shelf to be. You will fasten the boards for the shelf to the top of this support board and to one on the right side. Attach that piece with screws. Measure the front left leg from the bottom of the leg to the bottom of the board that you just attached to get the height measurement, then go to the back leg and, using the square and tape measure, mark the location where the bottom of the board will sit. 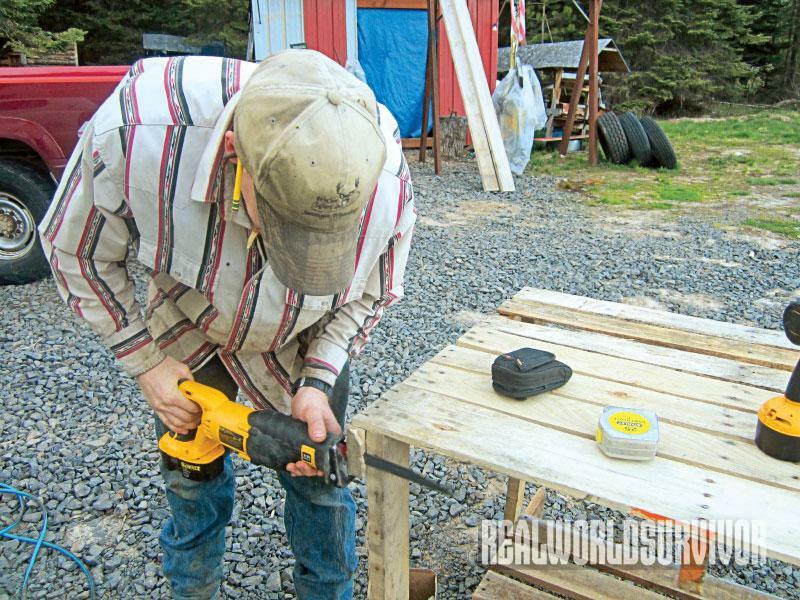 Be sure that the back left leg is square before attaching the board with the screws. 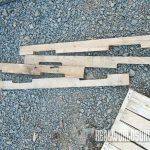 If it is too long, you can trim it later with a reciprocating saw. 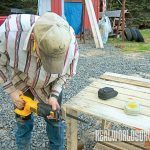 Once you attach the board, move to the right front leg and repeat the process with it and the right rear leg to make it square. You are ready to attach the board for the right shelf support just as you did on the left side. Once the left and right shelf supports have been added, place your tape measure against the inside left leg and measure from left to right to determine the length of the boards for the shelf. 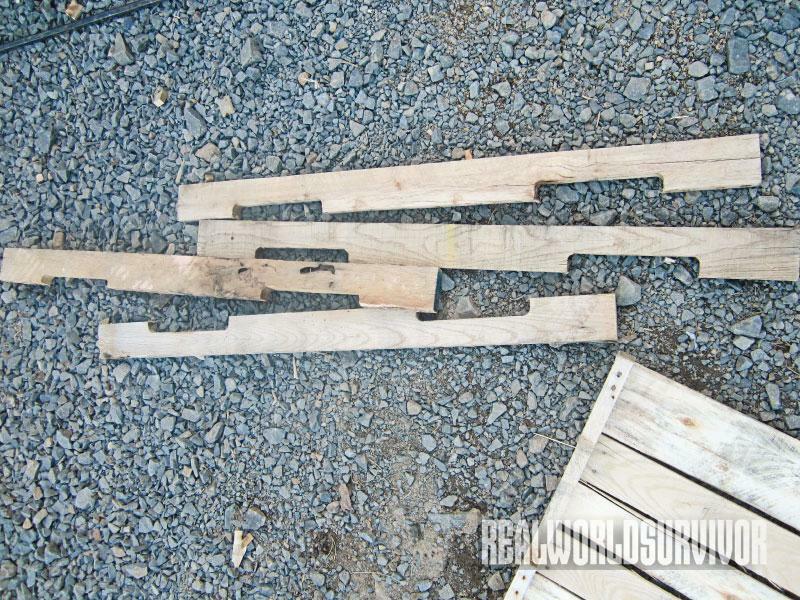 Once you determine the length of the boards, cut at least six boards to size, using a circular saw. Space them evenly on the shelf supports and attach them with drywall screws. Next my husband used a reciprocating saw to trim everything up in the front of the table so that it was even, prior to putting on the diagonal cross supports. Then we attached them, one on each side, placing full-sized boards from one corner to the other. They overlapped the legs, but we trimmed them later. Then we placed two horizontal supports across the rear of the table to keep it solid. We trimmed their extended ends and those on the diagonal supports. 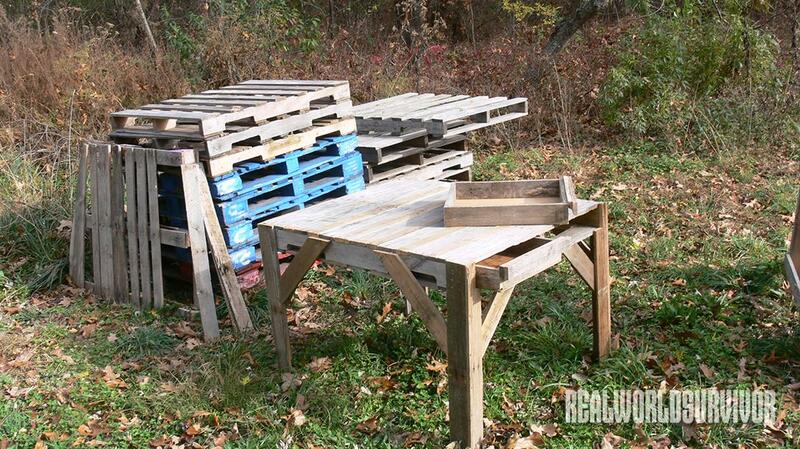 If you want, you can add a back to the top of the table like we did by utilizing a fourth pallet. I added the back to provide a place to hang things and to keep my Sun Oven from going off the rear of the table. 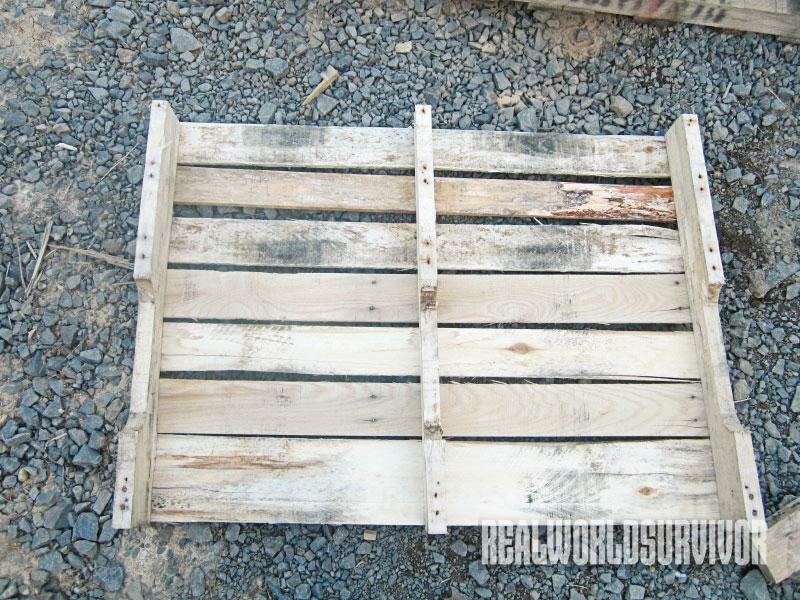 The back is pretty much the whole pallet except for the end board. We also added a board on either side of the tabletop to prevent things from rolling or falling off the table. To learn more about this and other projects, visit trayerwilderness.com.